Redux is normally associated with web development. Redux is a beautiful design pattern that can help with any application, even native Android ones! This is the approach that I took to integrate the Redux pattern into native Android development, and leverage the stability and predictability of a finite state machine to native development. Further, I used Firebase in order to do cross platform data synchronization across web and mobile clients. Firebase has the benefit of providing offline mode for web and native mobile client apps, which is incredibly powerful. Fast boot time by persisting the redux state to local storage. The ability to have anonymous auth (and save the state of the app), then switch to a signed in state and then retain the data that was created in the anonymous auth state of the app. Proper handling of sign-in and anonymous authentication, and not burdening the user with Login, SignUp, and SignIn. Just replace all that with a single button press that takes the app from anonymous-auth mode to signed-in mode. Using Redux middleware (and not just reducers) to play nice with Firebase updates, and solve a lot of murky synchronization issues that would otherwise present themselves. The app also has a sophisticated debug mechanism that exposes the history of redux state transitions and even the ability to diff between 2 states in the Android app itself. You can see the app going thru it’s state changes from startup until present moment. These are incredibly valuable insights that you have on the lifecycle of your application that you leverage to build some really compelling apps. Reducers and middleware are very similar on both native Android and web. Firebase auth is used in both cases, so that sign-in and anonymous auth work pretty much the same. 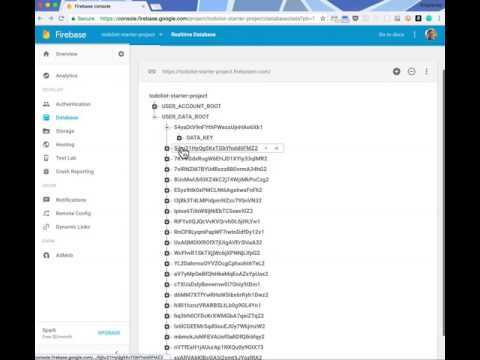 Firebase database is used in a similar way (in addition to the use of middleware) that makes user data synchronization between the web and mobile apps seamless, and offline! This entire app is built using Material Components for Android. You can learn more about it here. It uses both com.android.support:appcompat-v7 and com.android.support:design libraries in the app’s build.gradle. It uses AppCompatActivity from the material design support library (MainActivity.java). It uses Toolbar, FloatingActionButton, CircleIndicators, ViewPager, BottomSheetDialogFragment, a whole host of other Material Design components. It uses Material Design themes as well. It even uses ConstraintLayout in some screens, which was in beta while this was being developed. Please check out the ui package of the source code, and the res folder on GitHub. For more information on how Redux is used with the native Android app and how it syncs with the web app, check out the wiki page on GitHub. in this middleware, when redux actions come in for adding todo items or toggling todo items or deleting todo items, then modify what needs to be modified and save it to firebase -> do NOT dispatch these actions! next.dispatch(action) is what allows the middleware to keep processing actions in the chain. If this call was removed, then the middleware would just stop processing that action (just like java servlet filtering). So it’s best to make this call, and just ignore the actions that don’t need to be processed in the reducer. So there are some actions that will be processed by the middleware and others that will be processed by the reducer. The Redux library I’m using for this project is the Bansa library on GitHub. You can add it to your build.gradle and get started very quickly. // Base package. Everything else is built upon it! The way to get Redux and Firebase to work together is to use Middleware that handles some actions, and have the Reducer functions handle some other actions (instead of doing it all in the reducers). Now, regardless of whether these actions are handled by the Middleware or Reducers, they are dispatched to the Redux Store. the todolist data for this user. In the Redux Middleware, when redux actions come in for adding todo items or toggling todo items or deleting todo items, then modify what needs to be modified and save it to firebase -> do NOT dispatch these actions. For Firebase, create a firebase listener that simply takes the snapshot data and creates a redux action (like set_state_data) and then applies it to the redux store. The todo list app has to do a few things before it can be ready for use by the user (after the user has launched the app). It has to figure out whether its using anonymous auth or signed in auth, and then perform the auth, and then get the data from Firebase, then update the UI. This can take a few seconds over a slow cellular network. So what might happen is that the app is launched by the user and it doesn’t do anything during this time. Rule of thumb is that if an app is unresponsive for 3 seconds, users think that it has died. So how can we improve on this? On the flip side, when the Application class (App.java) loads, it initializes the Redux store and then loads the Redux state (if there is any) and then applies it to the Redux store! And voila! The app has restored itself instantly to the previous state that it was left in, the last time it was run! The beauty of using Firebase is that offline mode is handled for you out of the box. You have to accommodate the behavior of Firebase in order for this to work. 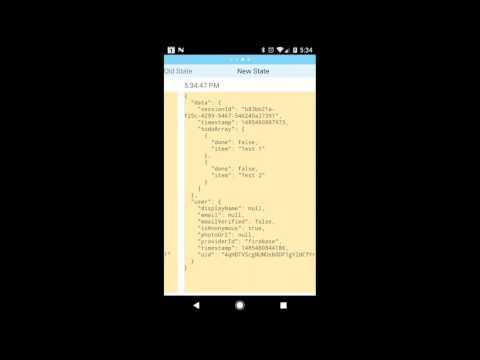 In Firebase, when you update a JSON object, then the listener is fired on the node that made this change. The reason for this is to ensure that the Firebase Database can operate in offline mode. So when you write to the database, it will notify you when this write operation has completed. So you request a write - you don’t force it to happen right now. This is why you have to shift your thinking from the mindset that when you mutate a data structure in memory, then this change has occurred already (if there were no exceptions). In the realtime database world of Firebase, we request writes/deletes/changes, and when they happen, we get notified and that is when we re-act to the data model having been actually modified. This is reflected in this todo list app in the way async actions are used in the Middleware, and how some actions are handled in the Middleware and others in the Reducer. So, if you can shift your thinking to this Firebase mindset and adopt Redux Reducers and Middleware, then yes, offline mode comes for “free”. A lot of people get authentication wrong. The notion of SignIn, Login, and SignUp being different things is a reflection of a lack of understanding of signin flow works. I’ve had the benefit of working on the Google+ team at Google and had a thorough exposure to the underpinnings of authentication and the UX of authentication. There are 2 critical times in most mobile apps - when a user is asked to signin and when a user is asked to checkout. These are times of huge abandonments and uninstalls of an app. So please keep this in mind when designing and building your next mobile app, whether it’s in Android, or iOS, or React Native. In our todo list app, we have no signed-out state at all! You are either signed in anonymously, or you are signed in using Google. I’m using Firebase Auth, so you can just keep adding multiple providers (like Facebook, etc). I’m just sticking with Google to keep things really straightforward on Android. There is one tricky thing to handle. Since the user is allowed to signin and out at will, and they might be signed into multiple Google accounts on their phone, this can lead to some interesting situations. The way this todo list app is designed right now is that any data created in anonymous auth mode will actually be saved when the user signs in (for the first time). This way, the work isn’t lost when they go from anonymous -> signed in. However, to keep things simple, I don’t do a sophisticated merge. I simply detect if the user data exists in Firebase, and if it does NOT then I copy the anonymous data to the new user account. However, if there’s pre-existing data for this user, then I delete the anonymous data. In the ‘real world’ you would want to come up with a better data migration policy than this, but this app is meant to be a teaching tool, and not a full blown production app. You can use the Redux pattern in your native Android apps, and iOS apps as well. It’s a very powerful way to simplify complex app state changes, and can improve reliability. Firebase provides offline mode, and Redux plays nice with it if you use reducers and middleware in the right way. It also provides a natural way to interact with any web apps that you have to build on the same backend.